← Corporate Tax Dodgers – Am I really more profitable than Starbucks? Today my blog returns us to the green hills of Shropshire and our final full day of our holiday towards the end of September. 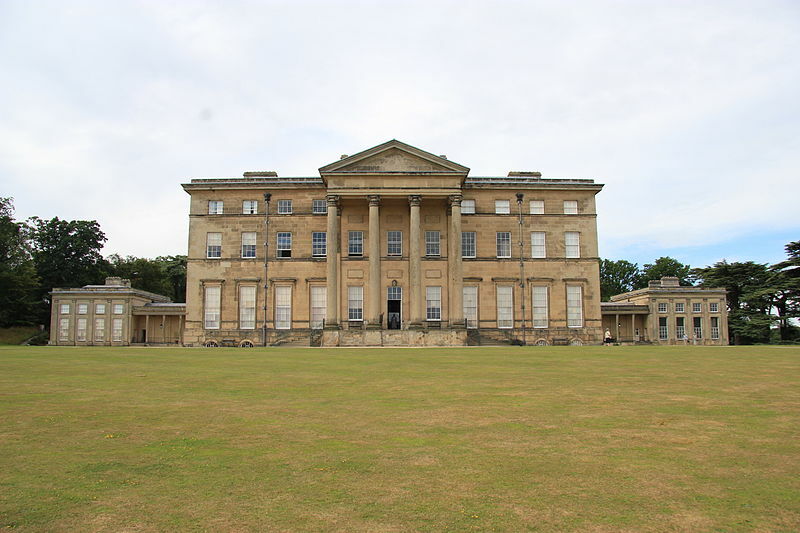 We chose to spend our day at Attingham Park, a grand house a few miles east of Shrewsbury. Compared to the houses we had visited earlier, Attingham seemed to be on an altogether grander scale. Originally built by George Stuart in 1785 for the 1st Baron Berwick, Noel Hill on the site of an earlier home, it was later expanded by the renowned architect John Nash. It continued in the family enjoying differing levels of prosperity depending on the wisdom and vices of its respective owners until the late 20th Century, at one point its grounds serving as an Air-Force base in WW2 and latterly as a college. 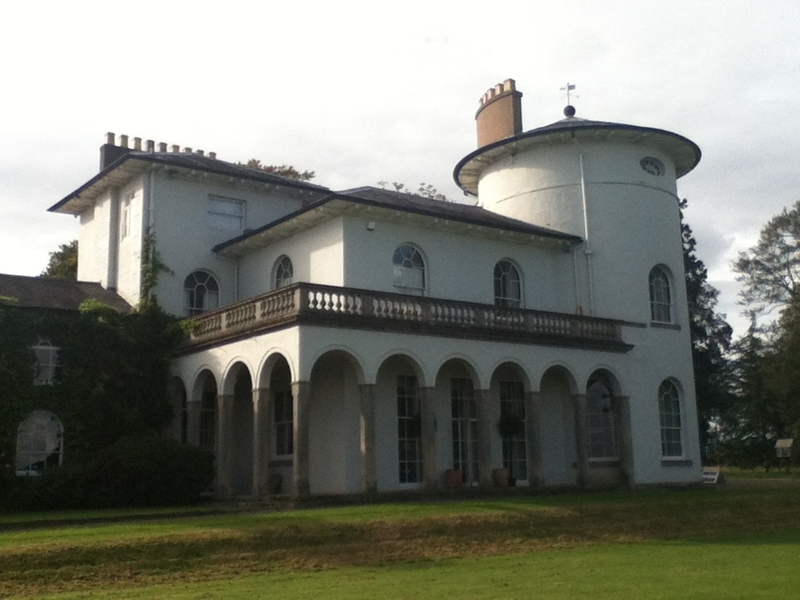 Today the home has been vacated by the family and is now owned by The National Trust; for the most part very lavishly decorated although its use as a college means a few of the rooms upside are missing their original furniture with long -term plans to refurbish them with period pieces over the next few years. The estate is huge and amongst other things includes parkland, formal gardens, landscaped gardens, lakes, orchards, 2 rivers, a walled garden and several hundred deer roaming around. Unfortunately due to the time of year and our itinerary, it wasn’t possible to fully explore the grounds but that is he beauty of these places. You can come countless times and if you ever tire of the houses or the history then you can go for long walks and picnics instead. Attingham may not quiet be the grandest house that we have visited but it is in the Premier League at least. On the day of our visit there were dozens of coaches filled with children and students but such is the size of the estate that after a few minutes of walking we felt that we had the place almost to ourself. We booked ourselves onto a free guided tour which was memorable for the guide dressing up in period costume and a very entertaining elderly volunteer who joked with me in every room about the house, the owners and even visitors in the guided tour party. 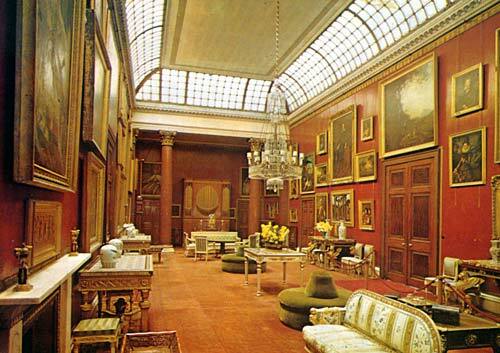 The first room in the house was the Grand Entrance which was lined with pillars and a marvellous floor-way with a row of seats against one wall where the gentleman would sit and wait for a servant to attend to the needs. Next up was a series of reception and dining rooms, all sumptuously decorated with crystal glass chandeliers, gold leaf furniture, large paintings including much Flemish art which happens to be one of my favourites and exquisite curtains that must be (5 metres) 15 feet tall. The guide told us that last year they had replaced a pair of curtains and they cost £16,000. There are possibly hundreds of windows in just this one house so you can imagine how much valued our membership fees are to maintain this and a thousand other properties which would otherwise be turned into hotels or left to fall into ruin. 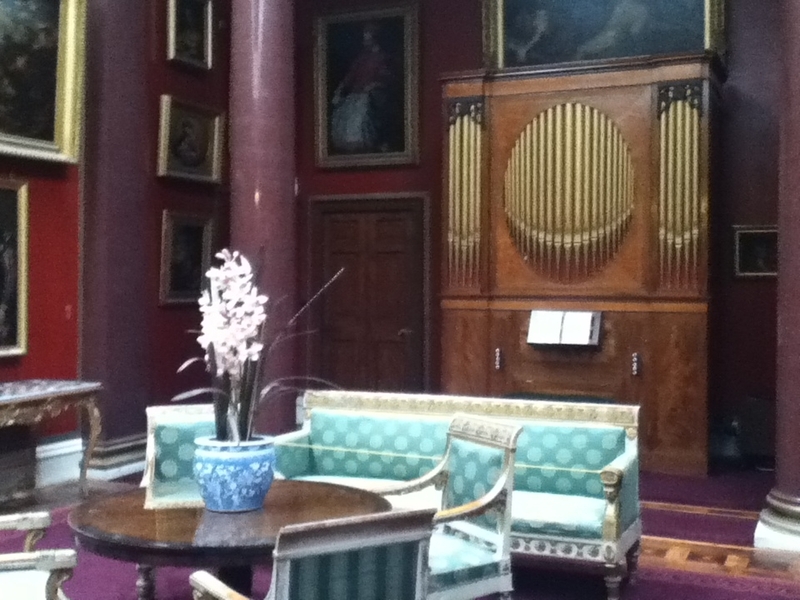 At the far end of the gallery a rare organ is showcased, constructed by Samuel Green in 1796. My favourite room was unquestionably the gallery which was designed by John Nash, one of Britains pre-eminent architects of his time. Furnished in dark wood and a deliciously dark crimson carpet and matching wall papering with more pillar, a giant chandelier with a picturesque staircase leading off in one direction and a giant traditional organ at the far end, the room itself is a work of art before we get to the paintings. Ahead of his time the room has a curved iron roof with large window panes as the owner specifically instructed Nash that he wanted the room to have natural light and not rely on windows or lamps. My favourite room in the whole house. A work of art in itself before you even see the paintings. Next up was the library, rather small in my opinion considering the stature of the rest of the house and then the dining room. You’ll notice on the photo below that the dining room is rather dark. This is partly for affect for us to see the house as it would have been perhaps a century ago but also to protect the furnishings from the sunlight. The curtains are only opened for the hours the house is open to the public not for any other times, even when there are guided tours. In the basement is the large and seemingly quite pleasant areas for the servants. The photo below is where many of them ate however not all of the servants ate here. 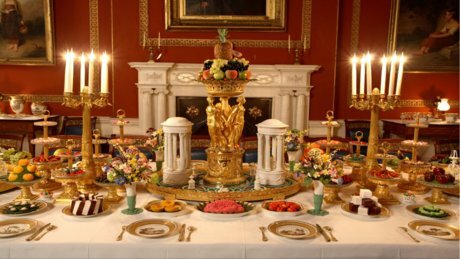 Such was the etiquettes of the time and the class-lad society that the 5 or 6 senior butlers and house-keepers would have their own room so as not to dine with their underlings. The kitchen staff like in many other houses also ate separately and this would sometime lead to suspicion from other servants as they suspected that the best food was kept for kitchen staff only. 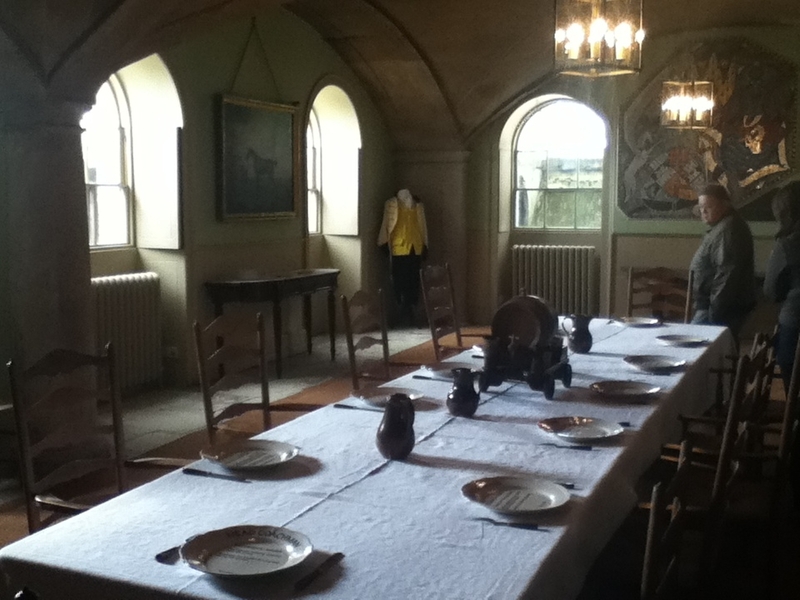 This is the main dining area for the servants. I wouldn’t mind having somewhere so pleasant to eat at work instead of a computer monitor or a freezing car. The kitchen was huge, it had to be to support all the goings on upstairs. Look at all the brass and copper pots below (I know one reader of this blog would appreciate them so I took the photo below). This was not the only set of pots either. There were other rooms for the staff including washrooms and stables. The top shelves show pots whilst the bottom have some moulds for desserts. We finished our tour of the house by visiting a room showing videos of the coronations of the 3 most recent monarchs crowned in the 20th Century. The residents of Attingham were of course invited to the investitures and the photo below shows the robes they wore to the Coronation of Her Majesty Queen Elizabeth II in 1953. 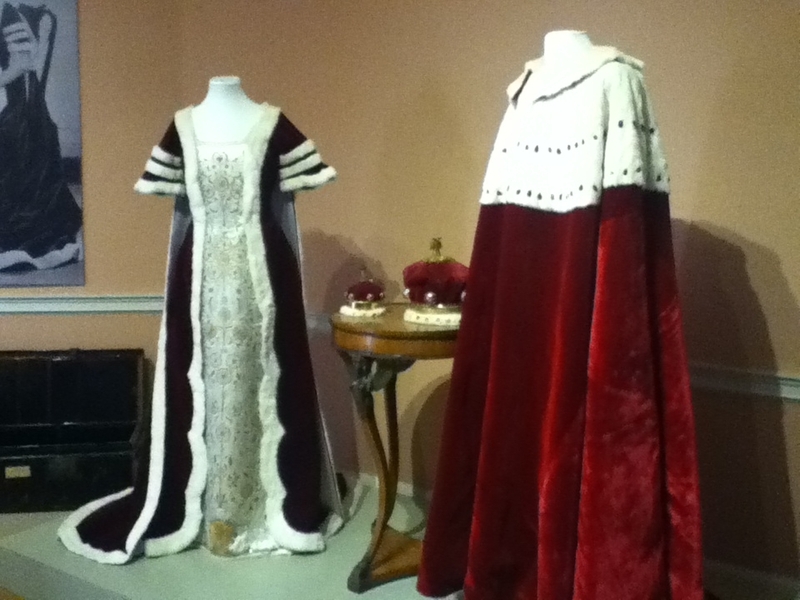 Robes worn by the Lord and Lady of Attingham at the Coronation of our current Queen, Elizabeth II on June 2nd 1952. Following a brief wonder through some orchards we stopped off and and some teas and hot chocolates as well as some pasties and sausage rolls before heading to the car. The reason we had come to Attingham today was that the owners later built an Italian style villa a few miles across the estate. 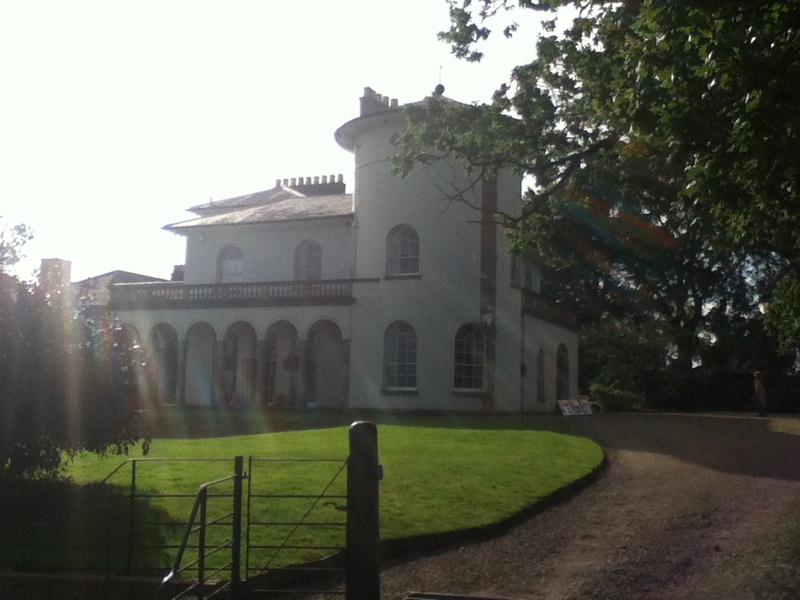 Cronkhill Italian villa designed by the renowned Regency architect John Nash between 1802 and 1805. This house though owned by the National Trust is leased and lived in by people today but is open to the public for 4 or 5 days a year and today was one of them. We weren’t allowed to take photos inside the house as it is lived in by a local landholding family who also happen to star in certain television programmes. However we were allowed to take photos from the outside and as you can see the house looked splendid in the September sunshine. Open for only a few days every year and September 30th 2012 was one of them! 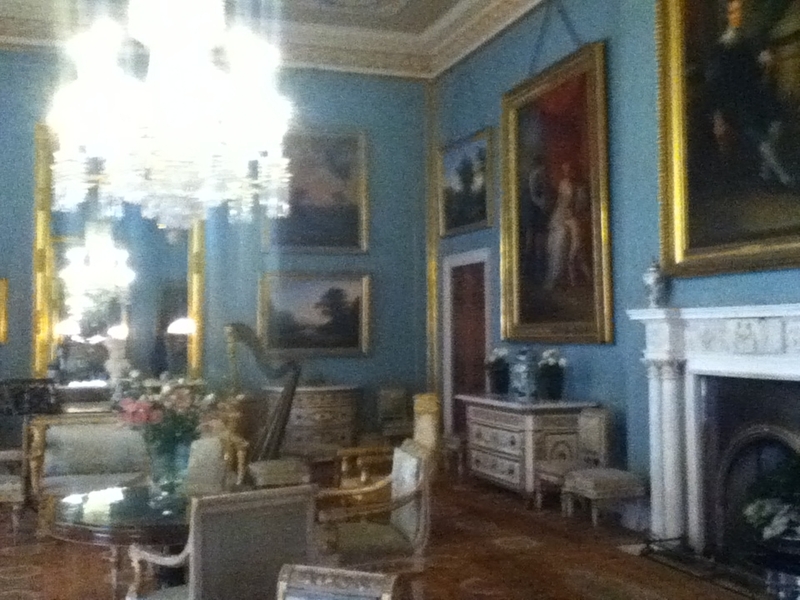 to visit possibly an even grander house on the way home. 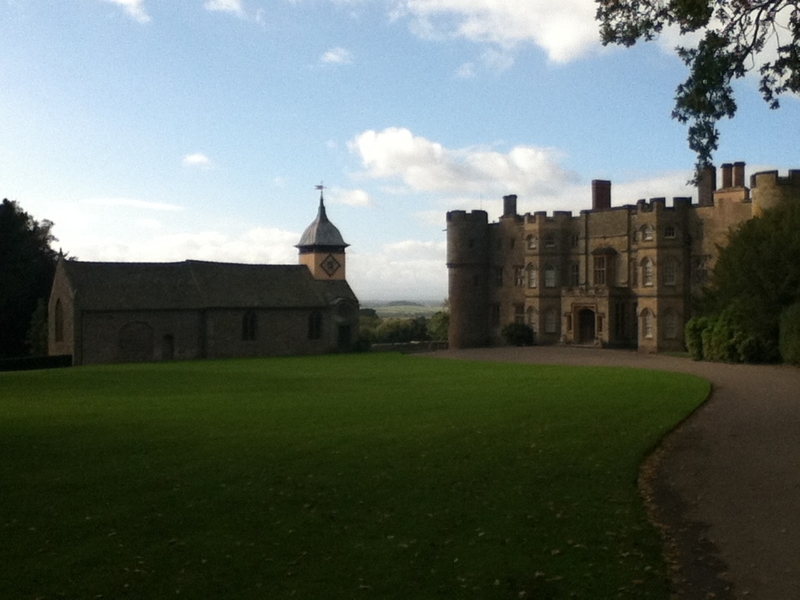 We only had time to spend an hour at Croft Castle in Herefordshire but what we saw of it means we will have to return one day as it is every bit the equal of Attingham if not more so. The main drive itself follows a tree lined avenue of over a mile in length and that sets the tone for this amazing property. Croft Castle with its church. The term castle is a misnomer as this particular building though built on the site of a castle was always built as a home, albeit a fortified one. The site has a long history of occupation with there being an Iron Age fort in one in corner of the estate with views over to the Black Mountains in Wales. The current house dates from the 15th Century though the aristocracy have lived there for centuries more. There is also a small church across the yard which amongst other things features the tombs and memorials of the family sons who were killed in WW1. Unknown to us until the guide told us and not fully appreciated until we got home, we could see the site of The Battle Of Mortimers Cross which was one of a series of battles in The War Of The Roses (the war being fought by competing competing Houses of York and Lancashire, each featuring a different coloured Rose as their emblem). On the 2nd February 1481 the 18 year old Edward, Earl of March defeated in battle Owen Tudor. Owen was captured and executed whilst 4,000 of his men were slain in battle and was another step in the road of what was essentially a civil war paving the way for Edward to be declared King Edward IV a year or so later. 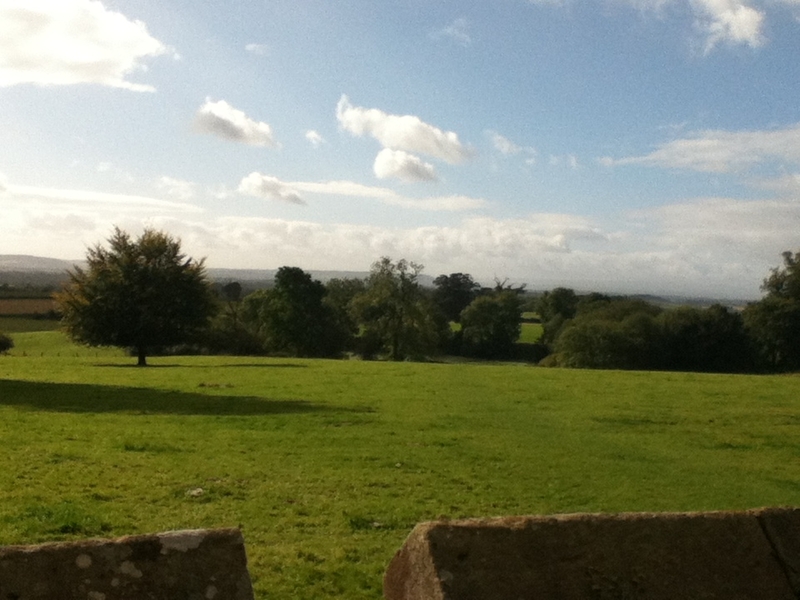 In the distance you can just see the beginning of the Black Mountains of Wales. The Battle of Mortimers Cross in the War of The Roses took place through the gap in the hedge-way (centre right) towards the back of the third field). The Croft Family at one point had to sell the house when their fortunes declined but a century later when they had recovered they were able to buy it back from its “new” owners. Even today the family maintain the use of some rooms in the house though the current Lord lives in Australia! 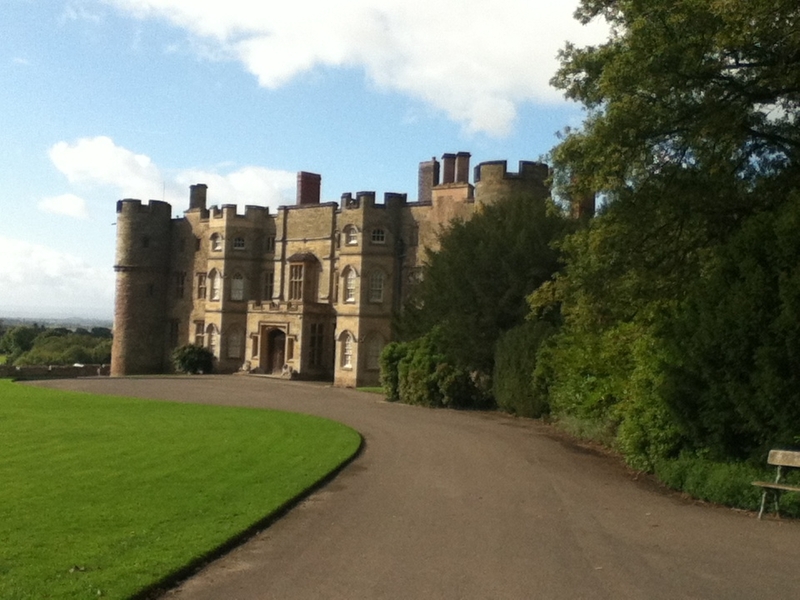 This entry was posted in history, Travel and tagged countryside, county of herefordshire, Culture, history, holidays, Long reads, national trust, shropshire. Bookmark the permalink. 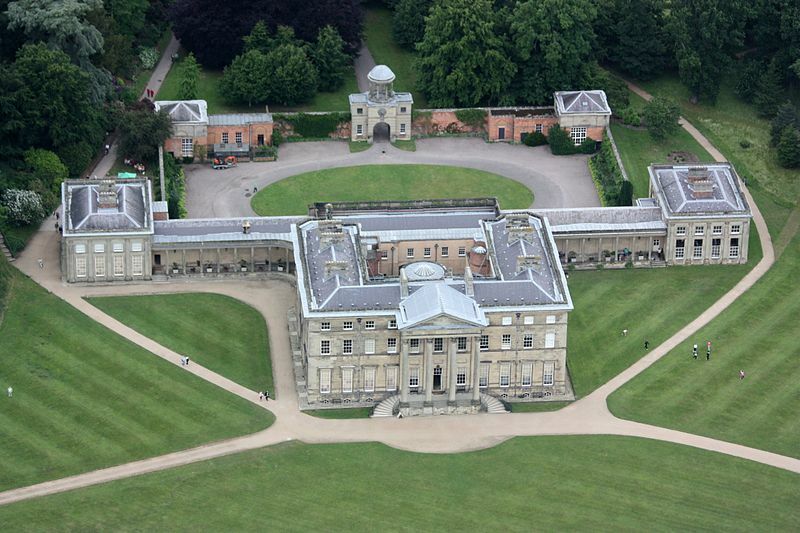 3 Responses to All about Attingham Park (and Croft Castle too)! 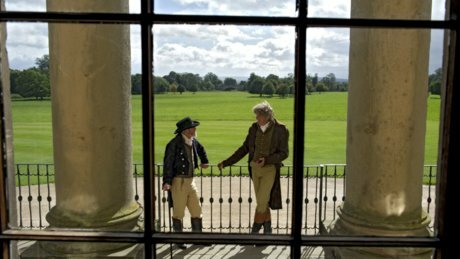 Attingham Park is one of the best places that tourists shouldn’t missed to visit in Shropshire.I’m glad that you shared it’s history here.I learned a lot.It is good to know the story behind the beautiful Attingham Park. 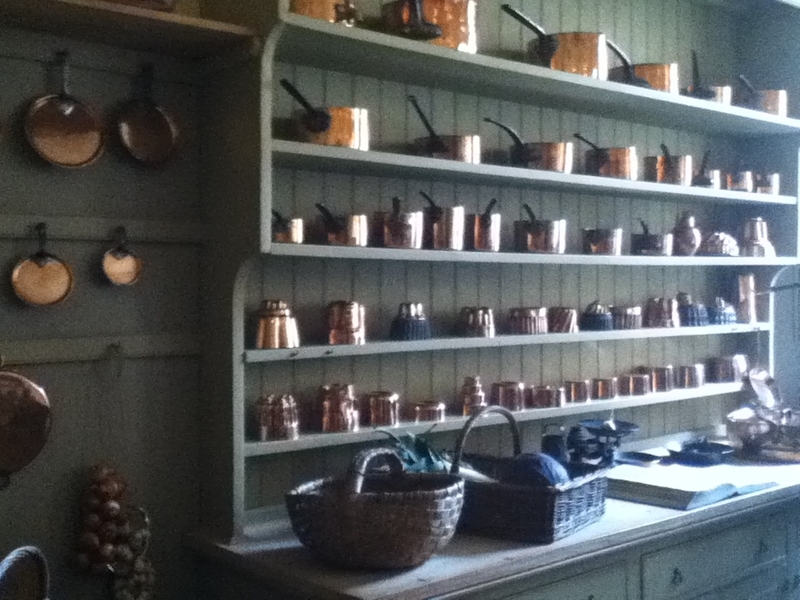 Yes, th copper pots look magnificent! I mean they really do. Aged but polished, with that incredible lustre opper has that can only attract the eye. A wonderful cooking pot, copper really does bring out a different – better taste in food, due to quick (slow is not always best in cooking!) and ”even heat” – Stephen, I’d like to use the photo – linked back to you, for a wee haiku on copper, if I may..
Of course you can, it would be an honour!